Andy Murray says he is physically feeling "a little bit better every day" after returning to the practice courts in preparation for the 2019 season. Murray, 31, ended his season early to focus on making "big improvements", having played in six events since returning from hip surgery in June. The Scot will train in Miami next month before making his competitive return at the Brisbane International in January. "I'm getting closer," said the former world number one. The Briton, now ranked 263rd in the world, has not played since losing to Spain's Fernando Verdasco in the Shenzhen Open in September. He has spent "four or five" weeks building his fitness with off-court training in Philadelphia and plans to increase his workload in Florida before flying out to Brisbane. 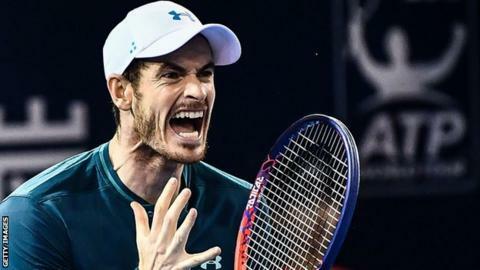 Murray is expected to play at the Australian Open later in January and has also announced his entry to the Open Sud de France in Montpellier - an ATP Tour 250 event which he has never previously played - in February. "I going to get to Miami for three or four weeks to train in the hot conditions and spend a lot more time on the court to get ready for the tournament in Brisbane," said the three-time Grand Slam winner. "I'm planning to get to Brisbane pretty early, probably a week before the start of the tournament. "I've been practising already for a few days and I've still got a couple of months to get myself in the best shape for the start of the tournament."